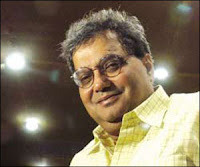 The media may've gone ballistic calling Salman Khan all kinds of names in the past, but there's one person who comes across as a staunch defender of the actor -- Subhash Ghai. ‘He's not a bad boy. He's grossly misunderstood,’ Ghai tells me. Ghai and Salman also had a spat before they shook hands and Ghai announced ‘Yuvvraaj’. ‘Yes, we fought and made up. Today, we're friends. Not many people offered me a helping hand after ‘Kisna’ flopped. I approached a lot of actors, but all I got were unfulfilled assurances and promises. When I approached Salman, he didn't ask questions, he said he was keen to work with me. How can I ever forget that?’ Ghai gets emotional. However, Salman's lackadaisical approach towards work -- reporting late on shoots -- was one of the reasons why ‘Yuvvraaj’ got delayed. True? ‘The film got delayed due to several reasons. I was keen on making certain changes and that took time. As for Salman reporting late for shoots, all I'd like to say is that he ensures that he completes his work on time, before we pack up for the day. Every director has to be a meticulous planner. If a certain star is arriving later in the day, he should be able to wrap up portions with other actors. If you can't, you aren't a good planner,’ Ghai adds.